Viva la dolce! : JANUARY DOLCE TO-DO LIST! Happy New Year everyone! Welcome 2018! The holidays have wrapped up (no pun intended, heh heh), and everyone is probably feeling a little tired. However, there is a freshness in the air - and it's not just due to the -25 degree temperatures we've been experiencing here in Toronto - it's the new year. A new year brings new opportunities, the chance for a fresh new perspective, and the opportunity to be your best self in the next 365 days. If you're feeling a little bit of pressure - don't. Instead, embrace the start of the new year, and take it step by step. Take some time during these first couple of weeks, to ease into the new year, and think about what it is that you truly want to accomplish in the coming months. Perhaps you want to write these goals down? Go ahead. Try doing that, and a few other things listed below, to help get your year off to a great start! 1. Reflect - Take some time to sit quietly with your thoughts, and think about your goals for the year ahead. Do you want to embark on a new career? Go back to school? Change houses? Whatever it is, don't just dream it, make a plan on how to do it. Especially if it is something you have been thinking about for a while. The time is now - make this your year! 2. Re-organize, Purge, Delcutter - It's a fresh new year, so in with the new and out with the old! This is the best time to take a look at all the stuff you never, or hardly, used last year, and put it in a "to-go" pile! Consider if you truly need the item; if not, then think about donating it to someone who does. 3. Photo/Document Clean Up - Speaking of cleaning up, consider saving some storage space on your hard drive and delete old photos or documents you no longer need. Finding it hard to let go? Save everything to an external hard drive, and you won't have to worry about any missing files. 4. Plan out more dolce time - Make it a point to carve out more "me" time this year. Whether you enroll in a favourite class, plan a monthly night with friends, or log some reading hours each evening, it's important to set out such expectations for yourself early on in the year, before work, family, and other such responsibilities takes over. 5. Fitness Goals - This isn't meant to pressure you into joining a gym, instead, it is a simple reminder to take care of your body. Often times, we get so tired and overwhelmed from our day to day, that we relish in the comfort of relaxing on the coach, with social media in hand. While there is no harm in taking a time out here and there, what's worrisome is if you begin to neglect your fitness needs entirely. If you're not the gym type, take some time to think about how you are going to incorporate healthy activities into your life this year. Perhaps a stroll after dinner each day, or power walking around the mall? Whatever you decide, just make a plan and stick to it. If you already have a fitness routine, challenge yourself to take on a totally new activity - perhaps mixed martial arts or rowing classes? Find something new to further your fitness engagement. 6. Be extra kind - What better way to start off the year, than by sharing some extra cheer? ?! January can be an especially difficult month for some. Individuals may be suffering from a lonely holiday season, stressing about their bank accounts after all the gift giving, or feeling depressed due to the cold and bitter winter weather (here in Toronto anyway). Try to lift someone's spirits with a simple smile, or perhaps even buy someone's coffee one morning. One positive action can totally transform someone's day and make it that much brighter! 7. Bake some cookies - With the cold winter weather upon us, there is nothing better than to cozy up inside somewhere warm with a cup of hot coco, and some treats! Whether it be cookies or whatever other dessert that delights your taste buds, take some time to bake a special treat this month. Consider doing this activity with friends and/or loved ones, to make it that much more fun! 8. Find inspiration - Where is your inspiration coming from this year? Perhaps you can read a few great books, watch some amazing TED speakers, or pair up with a mentor; make it a point this month, to find a source that speaks to you, and helps get you motivated to accomplish your goals for the year! 9. Make soup - They say soup is good for the soul. This seems to be especially true during these cold winter months! Whether or not you're the best cook, try your hand at some new recipes this month. 10. 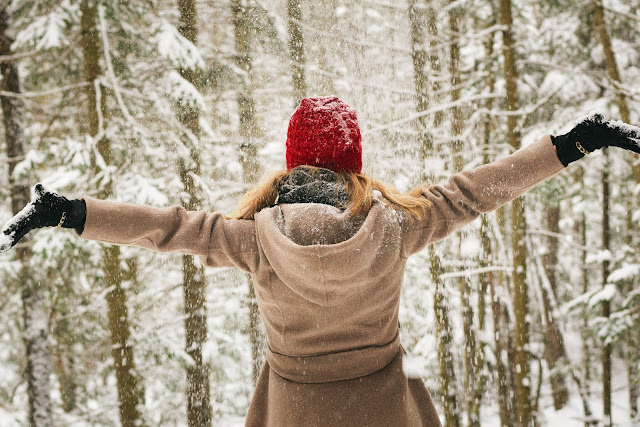 Play in the snow - Although as adults we tend to develop a hateful relationship with snow, we need not forget the joys it can bring. Remember as a child how thrilling it was to go tobogganing, build a snowman, or make snow angels? Have some fun again and play in the snow! You'd be surprised how much you actually enjoy it!